Estensi shipyard launches the 640 Maine its largest built model to date. The new Estensi flagship is again a design of Italian architect Maurizio Zuccheri, and this is the third model of this range from the Italian builder representing hybrid explorer cruiser and yacht looks. The 640 Maine joins the smaller 530 and 480 models. As the larger dimensions say the 640 Maine offers a very livable interior with a split level main deck, offering a saloon, separate galley, C-shaped dining table, and helm. This part will also offer two exit side doors which take you to the side deck conveniently located to port by the galley, and starboard by the helm. The lower deck of the 640 Maine is all dedicated to the four double guest cabins, three guest heads, and a two L-shaped bunk crew cabin located to aft. The owners stateroom is located to mid ship and on standard plan features a walkin' wardrobe, shower head with bidet, and relaxing sofa to starboard. But various options are available for making the owners room as one would desire from his and her bathrooms, and also the option of a private office. The flybridge of the 640 Maine is also to be offered in two options with a choice of tender stowage with crane or a free aft part reserved for entertaining. A choice of L-shaped or C-shaped settee is also available. 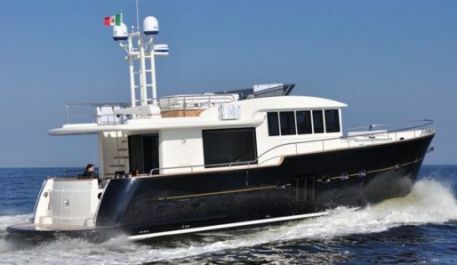 Power for the 640 Maine will be from twin Iveco FPT 825hp engines which give a wide open throttle speed of 27 knots.